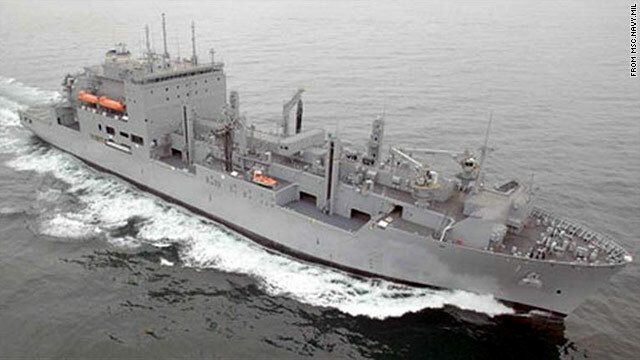 The Navy is expected to propose that the latest Lewis and Clark-class cargo ship carry the name of Cesar Chavez. But a senator says it continues a "rich tradition" of naming ships after "visionaries"
Washington (CNN) -- Labor organizer Cesar Chavez was always ready for a confrontation. And now the founder of the United Farm Workers, dead since 1993, is in the middle of a ruckus over the U.S. Navy's plans to name a new ship in his honor. Navy Secretary Ray Mabus will be in San Diego on Wednesday at the General Dynamics Nassco shipyards and is expected, according to the shipbuilding company, to formally announce that the latest Lewis and Clark-class Navy cargo ship will carry the Chavez name. The final decision on a ship's name is up to the Navy secretary. He considers recommendations from the Naval History and Heritage command and suggestions from service members, veterans and the public, according to the Navy. Rep. Duncan Hunter, R-California, objects to naming a ship for Chavez. In a statement released by his office, he suggested the Navy is paying too much attention to politics and not enough to tradition. "This decision shows the direction the Navy is heading," Hunter, a member of the House Armed Services Committee, said in his statement. "Naming a ship after Cesar Chavez goes right along with other recent decisions by the Navy that appears to be more about making a political statement than upholding the Navy's history and tradition." Cesar Chavez founded the National Farm Workers Association in 1962 and that grew into the United Farm Workers. He has been widely honored for turning the spotlight on the plight of farm workers and helping bring them better pay and safer working conditions. Long before this latest anticipated honor from the Navy, he was widely recognized for his work. Dozens of parks, schools, and streets are named for him, not just in California but across the nation. And then-President Bill Clinton posthumously presented Chavez the Medal of Freedom in 1994. Hunter said more worthy potential honorees were overlooked by the Navy. "If this decision were about recognizing the Hispanic community's contribution to our nation, many other names come to mind, including Marine Corps Sergeant Rafael Peralta, who was nominated for the Medal of Honor for action in Iraq," Hunter said in his statement. "Peralta is one of many Hispanic war heroes -- some of whom are worthy of the same recognition," the statement said. Meanwhile, Sen. Barbara Boxer, D-California, commended Mabus on the yet-unannounced decision to name a ship for Chavez. "I applaud Secretary Mabus for continuing the Navy's rich tradition of naming these supply ships after pioneers, explorers and visionaries," Boxer said in a statement, adding that Chavez "worked tirelessly to promote fair working conditions and equal rights for all Americans." A Navy spokesman at the Pentagon, Lt. Justin Cole, would say only that the Navy had not made a formal announcement and that any comments would have to come after that. The company said previous ships in that classification have been named for renowned explorers and pioneers in their fields. The Chavez is the 14th ship of the Lewis and Clark class built in San Diego, with the cargo ships designed to bring supplies to other vessels at sea. Cargo ships have been christened in honor of early-American explorers Meriwether Lewis and William Clark, as well as aviator Amelia Earhart and civil rights activist Medgar Evers. Company spokeswoman Mary Montgomery said the Chavez name selection has been widely applauded by the General Dynamics Nassco workforce. "Sixty percent of our work force is Hispanic, a very large number of our work force of skilled women and men," Montgomery said in a telephone interview. The shipyard is in the Barrio Logan area of San Diego, known for its Hispanic heritage. "We've had numerous positive comments from members of our work force because Cesar Chavez was such an important figure." Montgomery said. Chavez was a Navy veteran, and apparently had mixed feelings about the experience. "In 1944 he joined the Navy at the age of seventeen," his official biography on the United Farm Workers website says. "He served two years and in addition to discrimination, he experienced strict regimentation." Hunter is not the only one objecting the potential name. Even some proponents of Cesar Chavez are questioning the Navy's choice of his name. "We're talking about a person who believed in nonviolence -- the absolute core belief was nonviolence," said Randy Shaw in San Francisco, where he is the executive director of the Tenderloin Housing Clinic. Shaw also is the author of "Beyond the Fields: Cesar Chavez, the UFW and the Struggle for Justice in the 21st Century," published in 2008. "Do you think he would want a military ship named after him?" Shaw asked. "It seems pretty unlikely."